Jasmin Dhaliwal joined Burstall LLP as an Articling Student in 2018. She received her J.D. and her Bachelor of Health Sciences (Honours) in Biomedical Sciences from the University of Calgary. During her undergraduate degree, Ms. Dhaliwal was employed as a researcher in the areas of Autism, Parkinson’s disease and pediatric emergency medicine. Her research in Autism was published in the Journal of Neuroscience. During her time in law school, Ms. Dhaliwal volunteered with Student Legal Assistance and competed in the BLG Trial Competition and the McGillivray Moot. Prior to joining Burstall Winger Zammit LLP, she gained experience in litigation at a regional boutique law firm where she co-chaired a trial. 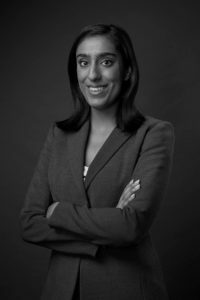 Ms. Dhaliwal also spent a summer working as a summer student at a global oil and gas company where she worked extensively with the in-house litigation group.